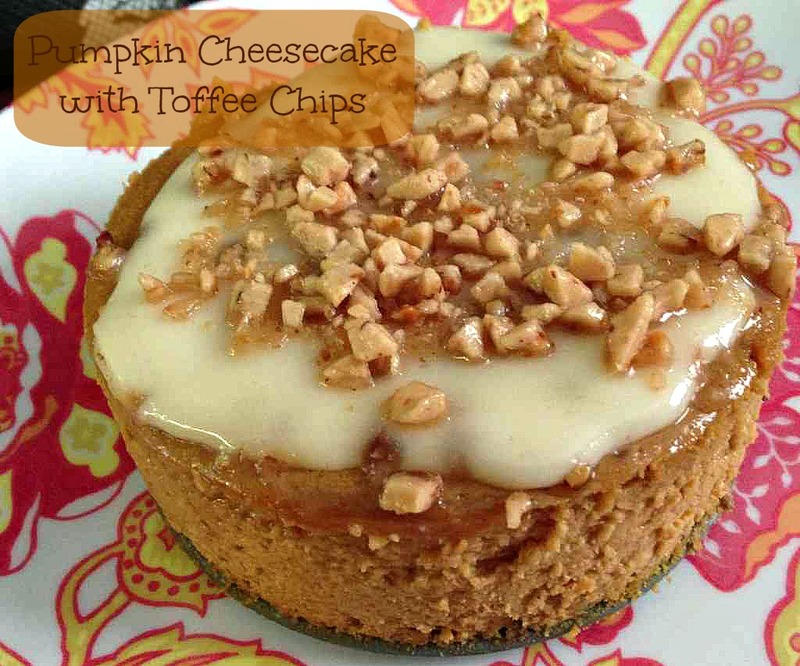 My friend Janet makes this fabulous pumpkin cheesecake topped with toffee chips and it is so delicious that I asked her permission to share the recipe with you guys. I’m planning on making a big one for the family for Thanksgiving dinner but Janet used small 4″ spring form pans for hers to make individual cheesecakes to share with friends. She tells me that she prefers to use ginger snap cookies for the crust but she was out so she used chocolate graham crackers instead. You could use any kind that you have handy. Mix the butter and cookie crumbs together then press into a spring form pan. Bake at 350 degrees for 6 to 8 minutes. Using a mixer blend the cream cheese and brown sugar together then add the pumpkin, evaporated milk, eggs, cornstarch, vanilla and almond extract. Pour into the spring form pan and bake at 350 degrees for 60 to 65 minutes until the outer edge is set. Mix the sour cream, sugar and vanilla together and spread over the still warm cheesecake. Sprinkle the toffee chips on top and serve.